Squad Up 4 Stack Up 2018 : Squad – Communicate. Coordinate. Conquer. To put it simply, veterans are at the very heart of Squad. Not only have veterans been at the core of everything we do, from coding to ensuring the authenticity of our assets to powering every aspect of our community, but they’ve also done it while dedicating their lives to serving the rest of us. Every year, we’re given the opportunity to work with StackUp.org to give back just a little bit to those who have given so much! On Sunday, November 11th, 2018, we’ll be joining forces with Onward and Post Scriptum to bring you a day of live streaming, giveaways, developer chats, and more! 1:00 PM – Welcome to the Stream! 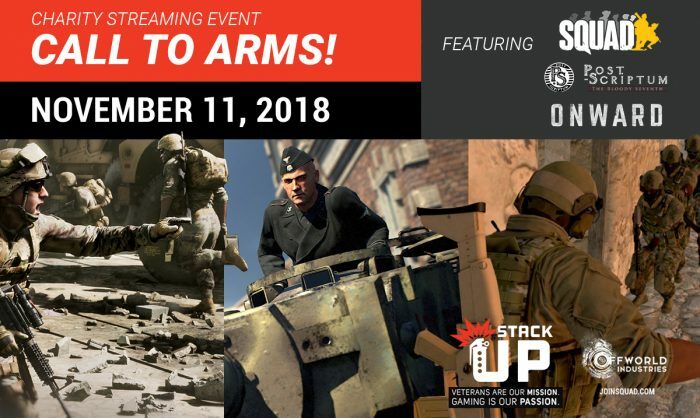 In conjunction with the November 11th Stack-Up event, Squad will be running a Steam free weekend beginning on Friday, November 9th at 1 PM Eastern Time. Even better, Squad will be 50% off! To sweeten the deal even further, our partners at Post Scriptum will be 25% off and the fine folks at Onward will be available at a 40% discount! The Squad community is filled with veterans of all generations and we are very fortunate to have the opportunity to play our game with them on a regular basis. They’ve become the backbone of many of the best communities and clans and we greatly appreciate their passion for Squad. We have many of our own who have served in various roles for their respective militaries and it is the least we can do to show our commitment to them as developers and partners. Our hope is that by becoming a fundamental pillar of Stack Up, with the help of our communities, we can start to effect change on a larger scale and encourage others to do the same. Together we succeed! On November 11th, we hope to see you at the charity drive to support Stack-Up and honor all those that dedicate their life to service. Special thanks to our streaming partners, developers, community members, and passionate fans that made this event possible.